This is a huge book. It has taken me over a month to work my way through it. Although I have a degree in science, it is in physics. I read this book as a lay person, so to speak, without advanced training in the biological sciences. My interest in reading this book came from being taught theistic evolution in a Christian college in the late 1960s. I found out that much has changed in the fields of biology and origins since then. Most of this book is written in a scholarly manner and may be beyond the interest of many Christians. Some of the essays are answers to critiques of previous articles and books. However, Christians interested in the issues of intelligent design, special creation, or evolution would benefit from carefully reading this book. The first part of the book is an in depth critique of the creative power of natural selection and random mutation. The conclusion is that these mechanisms do not have the creative power to generate new genetic information. The authors explain how current research shows a loss of information from such mechanisms instead. This section also includes a critique of the assumption of universal common ascent. They pay particular attention to fossil and DNA evidence. The next part of the book looks at the philosophical aspects of science and creating theories. The authors explore how one should define science and argue that science should not limit itself to strictly materialistic explanations. Rather than science correcting the Bible, perhaps Scripture should correct our scientific ideas. (707) There have been many scientific “facts” in the past that have turned out to be incorrect. It is also noted that theistic evolution fails to explain the development of moral values in humans and the spiritual nature of mankind. I have mentioned just a small part of all of the information included in this book. It is a detailed critique of theistic evolution and the works of those who promote it. I am impressed with the amount of information this book contains. It may be overwhelming for some readers. The chapters do contain summary introductions and conclusions to help readers navigate the text and decide which chapters may be of specific interest. “ID [intelligent design] is essentially consistent with biblical doctrine, and is supported by many scientists and theologians whose views cannot be lightly dismissed,” Colin Reeves writes. (706) Unfortunately, this book does not contain a presentation of intelligent design. I do recommend this book to Christians who have an interest in the issues of creation, evolution, and other aspects of origins. Be prepared for a good amount of time studying this topic. You can watch a very informative book trailer here. You can find out more about the book, the editors and contributors, and download an excerpt here. Note: I received a complimentary digital ARC of this book. My comments are an independent and honest review. Some of the quotes and page numbers I give may have been changed in the final published edition of the book. This Christmas, there’s plenty of room at the inn. Nestled in the snow-covered Sangre de Cristo Mountains near Santa Fe, the Grey Sage Inn looks like the perfect place for weary travelers to escape the craziness of the Christmas season. There’s plenty to see in historic Santa Fe during the day, and the inn’s owners, Maude and Silas Thornhill, are happy to spend their evenings hosting this year’s guests from across the country. But an unusual snowstorm throws a wrench in the festive mood. The sprawling inn becomes close quarters as stranded guests discover this Christmas won’t be the relaxed vacation they expected. Tension and fear mount as the storm worsens, and Silas, a retired doctor, is called away in the middle of the night to care for a neighbor. The snow and stress unlocks tongues–and in the unexpected conversation that follows, secrets and pasts are revealed, and hearts are healed. In the midst of snowdrifts and fireside conversations, of tales of days gone by, the warmth of Christmas brings a renewed hope as these trapped strangers become friends–proof again that the joy, hope, peace, and love of Christmas can be experienced no matter where you are. Learn more about the book, watch a book trailer, and purchase a copy here. This is a delightful Christmas story. While it got off to a bit of a slow start for me, by the time I got to the end I had thoroughly enjoyed it. Nichols has given readers a good combination of fun scenes and serious discussions. There is much about Santa Fe. The city is described so well I want to visit it. And the food served in the inn – it's a good thing a couple of recipes were included at the end of the book. I think it was the character studies that interested me the most. The owners of the inn lost their son when he was young. They've escaped every Christmas since, traveling to far off locations void of memories of past Christmases. The stranded guests force a change in the owners' plans and a change in their lives. Each of the visitors is an interesting character. It was fun to see how they all interacted to heal hurts, experience new adventures, and forge meaningful relationships. I recommend this book to those who enjoy a heartwarming Christmas novel. You'll read about the attractions in Sana Fe. You'll witness a little romance. You'll get caught up in a bit of suspense. But mostly you'll encounter wonderful characters on a life changing stay at Grey Sage Inn. I am participating in a blog tour of this book and you can read other reviews here. Phyllis Clark Nichols believes everyone could use a little more hope and light. Her character-driven Southern fiction explores profound human questions from within the simple lives of small town communities you just know you’ve visited before. With a love for nature, art, faith and ordinary people, she tells redemptive tales of loss and recovery, estrangement and connection, longing and fulfillment, often through surprisingly serendipitous events. Phyllis grew up in the deep shade of magnolia trees in South Georgia. Now she lives in the Texas Hill Country with her portrait-artist husband, where red birds and axis deer are her ever-ravenous neighbors. She is an English major and classically-trained musician, seminary graduate, concert artist and co-founder of a national cable network for the health and disability-related programming. After retiring as a cable network executive, Phyllis began leading mission teams to orphanages in Guatemala and now serves on three non-profit boards where she works with others who are equally passionate about bringing hope and light to those who need it most. I received a complimentary digital copy of this book through Litfuse. My comments are an independent and honest review. The rest of the copy of this post was provided by Litfuse. We get so caught up preparing for Christmas - Christmas decorations, buying presents, and planning meals. But what about preparing spiritually? Ciuciu has written this book to help us focus on Jesus during the Christmas season. I really like the format of this book. The reading for Sunday can be used in a family setting. There are passages to read aloud, a Scripture to read, discussion questions and a carol to sing. 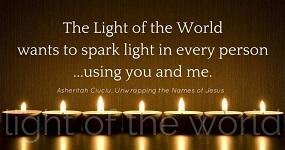 The readings for the weekdays contain short reflections on the names of Jesus. Each one of them has a challenge, a prayer, and Scripture for further study. Ciuciu writes how she came to appreciate the practice of celebrating Advent on Sundays in church. She realized she could also worship Jesus for who He is at home by meditating on a different name each day. The idea for this book of Advent devotions was born. I highly recommend this book for family and individual use. “We all suffer from soul amnesia,” Ciuciu writes. (13) This book has helped me remember who Jesus is and what He has done for us. The daily readings have helped keep my focus on Jesus in the midst of all the bustle. 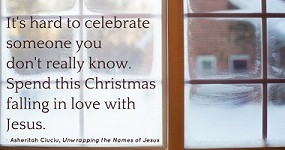 You can receive a sampler of the devotions at https://onethingalone.com/unwrapping-names-of-jesus-devotional/. You can find out more at www.UnwrappingTheNames.com. Asheritah Ciuciu is an author, speaker, and blogger. She grew up in Romania as a missionary kid and studies English and Women's Ministry at Cedarville University in Ohio. She shares personal stories and practical tips at https://onethingalone.com/. She is also a regular contributor at forthefamily.org and ungrind.com. She and her husband raise their children in northeast Ohio. I received a complimentary copy of this book from the publisher. My comments are an independent and honest review. This novella is quite an adventure for young readers. Sebastian travels through various quantum realms with a number of tour guides. He experiences life threatening travel and receives quite a few lectures on the nature of quantum reality. At one point Sebastian's brain felt like a grapefruit being squished. There is a great deal of science material in the story that will challenge readers. Readers learn much more in this short story than just about quantum physics. Sebastian also learns about identifying behavior patterns in himself and others. He is encouraged to use that knowledge to be self aware. There are some subtle lessons about being positive, not judging others, and not being afraid of differences in people. There is some heady stuff in the novel about the relationships between personal experience, information, and beliefs. Montgomery is a materialist, I think. He suggests in the novel that all emotions can be reduced to quantum frequency patterns. He says in his biography that he believes a fundamental knowledge of quantum patterns explains everything, especially human behavior. He communicates that opinion clearly in this novel. I believe there is much more to we humans than pure material existence so that aspect of the novella was less than satisfying. This novella is an exciting adventure into the quantum realm for young readers. One should be aware, however, that there is more than mere scientific knowledge being communicated in the book. Montgomery's views on the materialistic nature of humans comes through clearly. You can find out more about the book at https://www.theqre.com/. Mark A. Montgomery experienced a life transforming psychotherapy process in 2010. He began researching various sciences, leading to a desire to understand quantum reality. He has a passion to see that people understand how quantum patterns explain everything, especially human behavior. He lives in Oakland, California. I received a complimentary digital copy of this book through Book Publicity Services. My comments are an independent and honest review. I found the material in this book to be extremely helpful in my own spiritual life. Anyone who has longed for sustained intimacy with Jesus will find help here. An intimate relationship with Jesus won't just happen. One has to be spiritually intentional. Chole gives readers the tools for such a journey. I really like that readers are required to do personal soul work before venturing further to developing an intimate relationship with Jesus. That section of the book answered many questions for me and addressed many possible obstacles along the way. I have never seen this kind of progression in spiritual transformation before. Chole takes readers step by step on the spiritual walk. I felt like I had a personal mentor helping me. I gained new insight into what it means to have Christ at the center of my life. 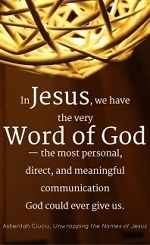 I gained new wonder for God's Word and really appreciated the instruction on relating to, not merely using, the Bible. This is a book one will work through, not just read. The last quarter of the book contains places for writing in response to the questions in each chapter. There are also exercises for each chapter, steps designed to get the reader in the habit of intentionally moving forward in spiritual formation. I found this book to be very thought provoking and encouraging as I work on being attentive to God and His work in my life. This is a book I'll return to time and again. I highly recommend it. Alicia Britt Chole is an award winning writer, speaker, and leadership mentor. You can find out more about her and her work at http://aliciachole.com/. I received a complimentary copy of this book through Handlebar. My comments are an independent and honest review. This is a book aimed primarily at wives of ministers. Powers is a pastor's wife and she laments in the first ten devotionals as she shares examples of the hurts she has experienced. She is honest in her feelings. “God, I don't like you right now.” (6) She suggests we don't hide from God when we are angry at him. She wants us to pour our feelings, like she does. Then be silent and wait, she says. Powers uses her own experiences and passages from Scripture for her teaching. Each devotion has a personal story, Scripture example and teaching for reflection, a written prayer, and thoughts for further contemplation. This book is for wives of ministers who have been hurt by people in the congregation. I had hoped the book would also be for those who volunteer in ministry but the text relates by far to paid staff, ministers and their wives. Laypeople and volunteers in ministry who have been hurt in a church experience may have difficulty relating to the specific slant of the devotions. I do recommend this book to pastors' wives. You'll find honest expression of hurt and sincere and encouraging writing about healing, restoration, and continued ministry. Leigh Powers is a pastor's wife and mother of three with fifteen years of full time ministry experience. She is a freelance writer, Bible study and devotional author, and a graduate of Southwestern Baptist Theological Seminary. She blogs regularly at www.leighpowers.com and www.pastorswives.com. In 1517, an unknown Augustinian monk, informed by his growing belief that salvation is by faith alone, published and distributed a stark criticism of papal abuses in the Catholic Church. In doing so, Martin Luther lit the spark for what would become the Protestant Reformation. What became known as the “95 Theses” was a series of statements expressing concern with corruption within the church, primarily the selling of “indulgences” to the people as a means of releasing them from acts of penitence. For the five hundredth anniversary of Luther’s revolutionary writing, This volume combines each thesis with an excerpt from one of his later works to provide a convenient way to understand the ideas and concepts that became the seeds of the Protestant Reformation. Print out a fun Luther mask here. This book is an introduction to Luther's writings, specifically the theses that precipitated the Reformation. The format of the book is such that a thesis is given then a relevant quote from a later work of Luther follows. The added quotes are usually from works written about three years later. They add some additional insight to the concerns Luther had with the state of the church in 1517. The format of the book was not as clear as it could have been. In the digital edition I read, the thesis was not set off in different type. I had to consult another source to make sure only the first paragraph in each section was the thesis. The quotes that follow each thesis are identified only by the title of the source document. No page numbers are given. This became problematic for me when I noticed the same paragraph appearing in two places. It begins, “Little children are saved only by faith...” (Loc 988/1827 and 1576/1827) The source is listed merely as “Table Talk.” The succeeding paragraphs differ so one or both quotes left something out. There was no way for me to check out the context of these passages or any of the other ones. Nonetheless, there are some insights from Luther that contemporary readers would do well to pay attention to. One is the sense of terror over sin that Christians should exhibit. Sorrow, contrition, penitence, mortification of the flesh – those are concepts we don't hear much from the evangelical pulpit. In thesis 40, “True contrition seeks and loves punishment...” (Loc 807/1827) How would that preach today? Luther's sincere criticisms of the practices of his day are still relevant. Luther was dismayed that the clergy let sinning Christians off with a financial payment. True remorse was not required. Clergy and believers would do well to review Luther's 95 in light of their own spiritual practices. I do recommend this book to those who want to know more of Luther and his influence on the church at that time. Potential readers must remember that the book contains Luther's works alone, without insightful contemporary commentary. Martin Luther (1483–1546) was a German monk, priest, professor of theology, and iconic figure of the Protestant Reformation. He strongly disputed the sale of indulgences, the church’s practice of selling pieces of paper that guaranteed freedom from God’s punishment for sin. In 1517, Luther directly confronted this and other papal abuses by publishing his “95 Theses.” In 1534, Luther published a complete translation of the Bible into German. Most historians believe that Martin Luther did not intend to spark a public debate. It was written in Latin, the language of scholars, and pinned to the door of the Wittenberg Castle Church which served as a “bulletin board” of sorts, where Luther knew fellow theologians would see it and perhaps engage in a discussion on the topic. Luther’s pamphlet, how­ever, was not another piece of paper flapping in the wind. Someone translated into German, and distributed it to the public with the help of a recent invention—the printing press. Luther tried to retrieve his work, but the damage was done. Within weeks, the debate that began in Wittenberg spread throughout Germany, and within months, all of Europe. Five hundred years later, Whitaker House presents each of Luther’s 95 Theses paired with an excerpt from his many writings. Not every excerpt directly relates to the accompany­ing thesis, but we endeavored to select passages in which Luther was expounding on the same subject. Where further explanation was thought necessary to contextualize his words, a footnote is included. We hope you find 95: The Ideas That Changed the World an accessible and fascinating look into the ideas of this groundbreaking priest who stood up for God’s Word, the grace of the gospel—and made history. I received a complimentary digital copy of this book through Celebrate Lit. My comments are an independent and honest review. The rest of the copy of this post was provided by Celebrate Lit. What we feel about the future impacts how we feel now. Eldredge wants readers to have hope, “the confident expectation of goodness coming to us.” (9) Jesus promised the renewal of all things in Matt. 19:28. Restoration of all things is coming, not annihilation. This all sounds wonderful but I was left with a few questions. Eldredge reminds us that some will not be a part of this renewal. (191) He failed to address how believers will feel when close friends or family members are not part of the renewal. “Nothing is lost, not for the friends of God,” Eldredge declares. (187) Will that be the case for a parent when an unsaved child is not part of the renewal? Eldredge encourages readers to know that “everything will be restored to you and then some...” (200) He is an outdoors person and wrote of bow hunting moose in the wilds of the Yukon – a “dream come true.” (202) For believers who love hunting and fishing, will that be restored and then some in the renewal? Eldredge recently discovered this truth of the future renewal. For Christians who are unaware of this aspect of the future, this book is a good introduction to the topic. To astute Bible readers familiar with Revelation 21 and similar passages, there may not be much new in this book. You will be able to read many portions of novels quoted at length, however. John Eldredge is an author, a counselor, and a teacher. He is also president of Ransomed Heart, a ministry devoted to helping people discover the heart of God, recovering their own hearts in God's love, and learning to live in God's kingdom. He and his wife life near Colorado Springs, Colorado. I received a complimentary galley of this book through Icon Media. My comments are an independent and honest review. Christmas is more than just a holiday. It is a time to recapture the joy and wonder of God’s greatest gift: His Son, Jesus. 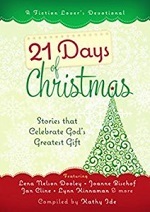 21 Days of Christmas will warm your heart with stories about giving, loving, and family. 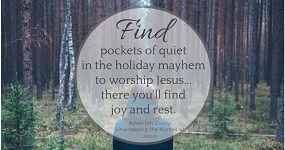 These engaging tales celebrate the hope and joy that make this blessed season unique. At the end of each story you’ll find an insightful message that will help you discover anew the true meaning of this special time of year. So grab a cup of hot apple cider with a cinnamon stick, curl up in your favorite chair beside a picture window overlooking a serene spot, and savor the true meaning of Christmas through these inspirational and encouraging stories. Ide has collected a good selection of short stories by a variety of authors. Most are just one scene or event and can be read in a couple of minutes. I was pleased that the quality of the stories was consistently quite good. The stories are like parables in that they illustrate truths about life. Each story is followed by a Life Application section, highlighting the truth for the reader. I recommend this book to fiction lovers as a good devotional for the Christmas season. You'll read entertaining and thought provoking short stories while gaining insights about life. Kathy is the editor/compiler of the Fiction Lover’s Devotional series (www.FictionDevo.com) and author of “Proofreading Secrets of Best-Selling Authors” (http://secretsofbestsellingauthors.com). She has also written numerous articles, short stories, devotionals, play scripts, and Sunday school curriculum. She has ghostwritten ten nonfiction books and a five-book novel series. She is also a full-time freelance editor, working with aspiring, new, and experienced authors as well as publishers. Kathy speaks at writers’ conferences across the country. She is the founder and coordinator of The Christian PEN: Proofreaders and Editors Network (www.TheChristianPEN.com) and the Christian Editor Connection (www.ChristianEditor.com). For more about Kathy, visit www.KathyIde.com. I received a complimentary digital copy of this book through Celebrate Lit. My comments are an independent and honest review. The rest of the copy for this post was provided by Celebrate Lit.